Why does Shakespeare write in the way he does? And how can actors and directors get the most out of his incomparable plays? In Speaking the Speech, Giles Block - 'Master of the Words' at Shakespeare's Globe - sets out to answer these two simple questions. The result is the most authoritative, most comprehensive book yet written on speaking Shakespeare's words. Throughout the book, the author subjects Shakespeare's language to rigorous examination, illuminating his extraordinary ability to bring his characters to life by a simple turn of phrase, a breath or even a pause. Block shows how we can only fully understand these characters, and the meaning of the plays, by speaking the words out loud. Drawing on characters from across all of Shakespeare's plays - and looking in detail at Macbeth, The Winter's Tale, Hamlet, The Merchant of Venice and Much Ado About Nothing - Block covers everything the actor needs to know, including: the essential distinctions between prose, rhymed verse and unrhymed verse, and the different strategies to be used when speaking them; the difference between 'you' and 'thou'; Shakespeare's use of silence; and the vital importance of paying attention to Shakespeare's 'original' punctuation. 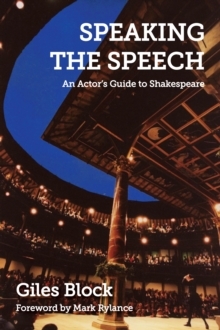 Speaking the Speech is a book for actors and directors who want to improve their understanding of Shakespeare's language in order to speak it better. It is also a fascinating read for anyone who wants to deepen their appreciation of Shakespeare's language and the way it comes to life when spoken aloud. 'We call Giles our 'Text Guru' at the Globe, partly in jest, and partly out of respect for the depth of his knowledge, the gentleness of his teaching, and the sudden illuminations he can throw across a play. If this book can afford even a small part of the pleasure and insight Giles can provide in person, then it will be a great asset. 'Dominic Dromgoole, Artistic Director, Shakespeare's Globe 'Giles deepened my love for Shakespeare and for the way we all speak.